NEW YORK, NY, February 8, 2013 — MCA Music (Universal Music Philippines) unleashes "The Walking Dead AMC Original Soundtrack Vol. 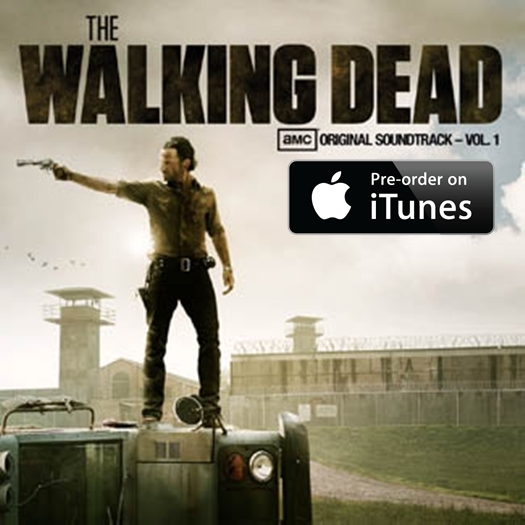 1" and is now available for pre-order on iTunes http://smarturl.it/WalkingDeadVol1iT . The soundtrack will be out in select stores and via online retailers by March 18. Showcasing music featured on the Emmy Award-winning AMC series, this collection proves essential listening for viewers and zombie enthusiasts everywhere. Fans who pre-order the soundtrack will instantly receive a download of Jamie N Commons' "Lead Me Home." Two incendiary tracks have already debuted in the first half of Season 3 — the powerful folk elegy "The Parting Glass” by characters Emily Kinney (Beth Greene) and Lauren Cohan (Maggie Greene) " and Baby Bee's guitar-heavy zombie blues jam "Love Bug." Next up, Jamie N Commons' "Lead Me Home" will figure prominently on the March 3 episode as well as various AMC promo spots, followed by Fink's "Warm Shadow" (Dactyl Remix) on March 10, and Voxhaul Broadcast's "You Are the Wilderness" on March 17, leading to the album’s release date. Furthermore, the compilation boasts previously unreleased material including "Sinking Man" from multiplatinum-selling Icelandic alternative folk sensation Of Monsters and Men, an UNKLE remix of composer Bear McCreary's "Main Title Theme Song", Delta Spirit's "Running", and more. Just like the show, the soundtrack remains a dynamic powerhouse replete with unforgettable moments. AMC's "The Walking Dead"—the number one drama series in basic cable history—returned for its third season last October 14. Based on the comic book series written by Robert Kirkman, the series garnered a 2010 Golden Globe® nomination for Best Television Series – Drama and won the 2011 and 2012 Emmy® Awards for Outstanding Prosthetic Make-Up. "The Walking Dead" tells the story of the months and years that follow after a zombie apocalypse. Dive even deeper into the mythos and legend of "The Walking Dead" through "The Walking Dead AMC Original Soundtrack — Vol. 1" available March 18! 1. Jamie N Commons – "Lead Me Home"
3. Voxhaul Broadcast – "You Are The Wilderness"
4. Baby Bee – "Love Bug"
6. Of Monsters And Men – "Sinking Man"
7. Emily Kinney and Lauren Cohan (Beth & Maggie Greene)– "The Parting Glass"
8. Delta Spirit – "Running"
Pre-Order “THE WALKING DEAD (AMC Original Soundtrack Vol. 1)” on iTunes!